"Excellent staff, professional gear, great facilities/aircraft. I can't imagine having done my first jump with anyone else. These people have a passion for what they do, and a passion for teaching you how to do it and how to stay safe. An incredible experience overall and I would recommend to anybody that they share it with this crew!" "5 stars!! All the staff we encountered were approachable and open to questions and overall just a great environment. Amazing jump with James and videographer Stash! They both are very professional and I enjoyed working with them both. James is a PRO, very thorough and confident, which helped ease my fear. Can’t express how much I enjoyed this experience and can’t wait to come back for more!!!" "I had my first jump here and it was an amazing experience! My instructor Brian was extremely helpful and friendly, I felt I was safe and could rely on him to get me back to the ground safe and sound. My photographer Tubbs was super friendly and funny, I really enjoyed her company and the pictures & video she took. Everything - the facility, the plane, the equipment - was nice all around, and every stuff member made me feel welcomed and relaxed. Definitely coming back here, these guys got me hooked!" “Loved every bit of it!" "We went for my dad’s 60th birthday and had an unbelievable time! Staff is great at calming your nerves and making you feel safe! The photographers take amazing videos and photos! I have recommended this place to many people! Loved every bit of this experience!" "My boyfriend and I went on our first jumps last Sunday and it was by far the most incredible thing we have ever done! I cannot wait to go back! ... My instructor, Nate, and my boyfriend's instructor, Andrew, were really cool and funny while still being super professional. Their kindness and, more importantly, their confidence took almost all of my nervousness away! Our video guys, Yoshi and Nathan, were hilarious and did a great job on the videos. I recommend spending the extra money on the videos for your first jump as the reactions are priceless and it is really incredible to see yourself flying through the air... 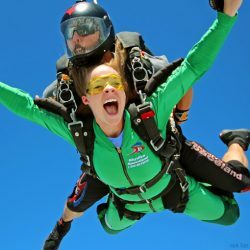 I cannot recommend skydiving in general and especially this place enough!"